Without the vital, year-round support of our corporate partners, our work just wouldn’t be possible. Becoming a Corporate Partner is a great opportunity to become involved with BBBS in a variety of ways, give back to the community and help build a confident and capable workforce for the future. 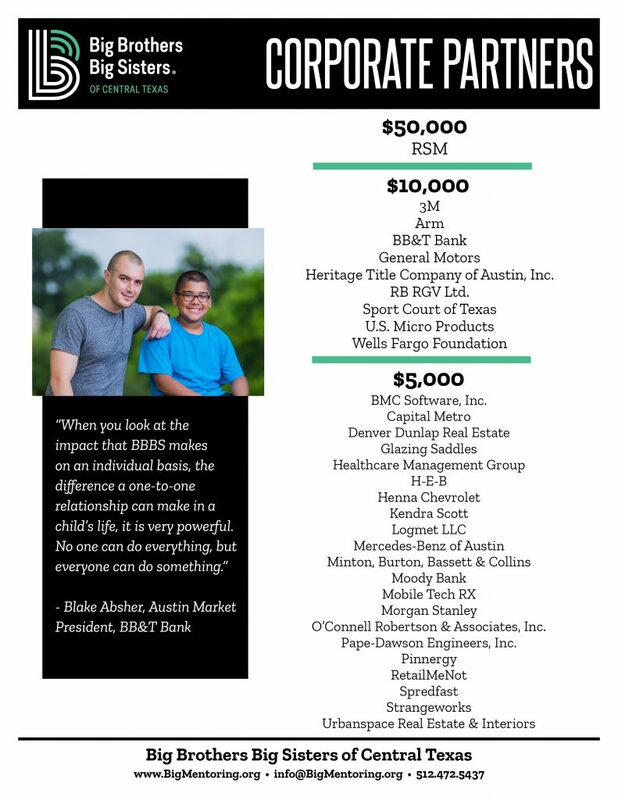 In addition to making monetary donations, Corporate Partners can support BBBS in many ways. Often, they match donations to BBBS made by their employees, support our fundraising events, designate our organization as the charity of choice for an employee-giving campaign, or provide educational and career workshops for our Little Brothers and Sisters. We are happy to meet with you to create a customized Corporate Partnership plan that best suits your business and philanthropic needs. Please join us in our work to change children’s lives for the better, forever. For more information on becoming a Corporate Partner, please contact our Development department at development@bigmentoring.org or 512-807-3609. “We love doing this. We love BBBS and we’ve been participating in the Holiday Party for 4 or 5 years. One of our company’s goals is giving back to the community and this is a great opportunity to be involved.” –David Alben, CEO of U.S. Micro Products.